Some of you probably know I don't have much patient to do blog awards. I appreciate everyone who gives them to me but sometime I get so hectic I forget. I had time today and I came across a comment in my previous post, so I thought I should really check it out and try to do it this time round. 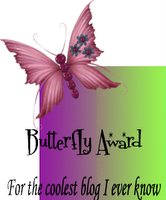 I want to thanks Rinz from miss-rinrin.blogspot.com for tagging me int his awesome blog award! Thanks sweetie! Link it back to the one who sent it to you and then pass it on to 7 people. Also, I have to write 15 random things about myself. 1. Even though I’m a girl, I’m not a big fan of pink so some of you might have noticed I rarely wear anything pink (clothing, accessories). I think the only pink things I ever use is probably, blush or lipstick/lip gloss. 2. I wear shorts and skirts more often, not because I don’t like pants more so I find it difficult to find pants that fit me nicely. Then again I’m pretty short thus I have to alter them sometimes it is just too much of a hassle or it doesn’t look as nice as it did before the alteration. 3. I’m a manga and anime geek! I love them and I think I always will. 6. I’m obsessed with sparkly watches and accessories. I love my bling blings!!! 8. I want to try sky diving at least once in my life. 9. I like travelling, be it to another foreign country or even just a road trip to a small town or country side. 12. I’m allergic to Kiwi Fruit and I will actually turn blue if I eat it. Just touching it sends shivers down my spine. 13. I love headbands; I’m always hunting for new ones. Even my mum buys me headbands as gifts when she goes on holidays now. 14. I’ve been wearing one necklace for the last 4 years, I even sleep with it on and shower with it on. You might have notice it in my photos it’s a white gold chain with a jade pendent on it. It’s actually a key shape and I got it from my mum for my 21st birthday. Now I have to pass this onto 7 people and I've listed them in random order. I seriously just picked them out randomly from my blog list that I follow and love to read. I thought it was actually fun writing out 15 random things about myself even if it took me forever!